Versatile lever gun features automatic variable stroke/pressure, air vent and loader fitting. Comfortable vinyl grip. Style/Type: Lever; Pressure: 10,000 psi; Capacity (Volume): 16 oz; Cartridge Size: 14 oz. 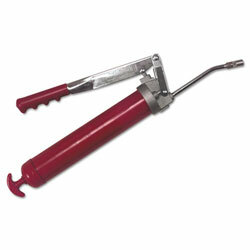 Grease Guns from Alemite! 221 In Stock today.